Imagine that you are in a cinema. It’s Friday and you’re exhausted. You’ve had a tiring day and a tough week. In fact, the past few years have been relentless – you’ve been working harder, and for longer, than ever before. You feel drained. As you sit in your upholstered velvet seat and gaze towards the screen, you start to relax. You feel a tingle of excitement, of anticipation. You feel something else, too: a sense of gratitude to the cinema, and what it offers you in times of stress and distress. You think about the release it can afford from the concerns and trials of the everyday world, the possibility of escape. And entertainment, of course: laughs, tears, thrills, romance, music, movement, emotion, drama. Now imagine that just as the trailers come to an end, and as you begin to focus your attention more completely on the screen, you hear a siren outside the cinema. Shortly afterwards, there is a deafening explosion. The roof collapses. You can hear screaming. There is dust and the smoke everywhere. You stagger from your seat, passing the lifeless bodies of some of your fellow cinemagoers, and make your way outside. You take a moment to look behind you. The cinema has been badly damaged and the High Street on which it is positioned, and which it had previously dominated, looks different, somehow poorer. You realise that the cinema has been hit by a bomb, and that the war that has been going on since September 1939 dominates your leisure time just as it does your working hours and your private life. Something similar happened to cinemagoers in East Grinstead, Sussex, on 9 July 1943, when a 500-kilogram high-explosive bomb was dropped on the Whitehall cinema from a Luftwaffe aeroplane. More than 80 people died, another 50 were seriously injured. The number of fatalities and casualties would almost certainly have been higher if the bomb had not hit the cinema at just after 5 o’clock in the afternoon, when it was only half full. The Whitehall never reopened. Although the number of deaths made the destruction of the Whitehall unusual, it was not alone in suffering damage: during the blitz, as many as ten per cent of British cinemas were out of action at any one time as a direct result of enemy action. The war constituted something of a golden age for British films, both in terms of their quality and their perceived social function. Few people questioned the cinema’s importance as an art-form, as a chronicler of the national experience, or as a means by which the government might communicate with the general population. Yet although British cinema of the war years has been thoroughly researched, British cinemas and cinemagoing in the same period has not received the same level of attention, even though the Second World War was the era of peak cinema in Britain. Total annual attendance increased from 990 million in 1939 to 1,585 million in 1945. By the end of the war, box offices were so busy that, on average, enough tickets were sold for 60 per cent of the British population to attend in any given week. How the war and wartime legislation affected the cinema is the subject of my book Cinemas and cinemagoing in wartime Britain, 1939-45: The utility dream palace. Cinemagoing is something that people do – and, more importantly, it is something that people do in particular places at specific times. Cinemagoing was a central component of many Britons’ lives during the war: it was not simply an escape from the everyday, it was a part of it. British cinemas were so intimately woven into the fabric of British society that they were no more able to break free from the war’s orbit than were the people who attended them in such numbers week after week. The blackout, the blitz, conscription, evacuation, the rationing of food and materials, all of these wartime phenomena – and a host of others – had an impact upon the ways in which cinemas were run, and the ways in which they were experienced. In a sense, the history of wartime cinemagoing is the history of what it was like to live in Britain during a period of total war; the conflict changed almost everything. Yet despite all these changes, the cinema retained its massive popularity. The war years saw almost continual tension between the pleasures that the cinema offered and the impact that war had on the cinema as a place of business, a place of work and a place of leisure. That ticket sales remained so strong suggests that a successful balance was found between the demands of the war effort and the idea that the cinema was a site that held out the prospect – if not the reality – of escape. 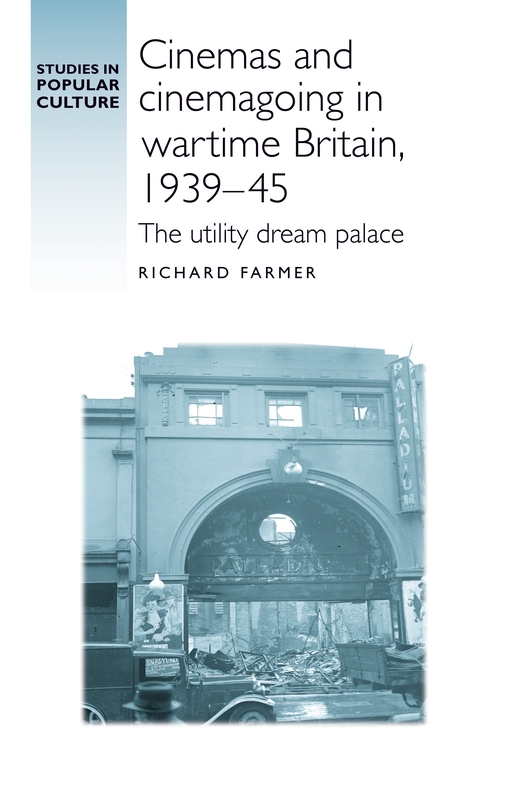 Cinemas and cinemagoing in wartime Britain, 1939-45 by Richard Farmer is available now. Category: Blog, Cinema, Film & Media, History	0 Comments.